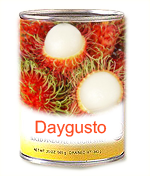 Canned Rambutan in Syrup 24/20 Oz. Whole 230 g. 565 g.
Canned Rambutan Stuffed with Pineapple in Syrup 24/20 Oz. Whole 250 g. 565 g.